The TurnStyle 20 in Blue Slate. Picture courteous of TTP. It is hard to describe the shape of the TurnStyle, it is kind of pyramidal, broader at the base and tapers nicely towards the top both from the side and front profile. The resultant “wedge” at the top of the bag leads a broad, shaped sling strap. The empty weight of the TurnStyle 20 (the one I received) is light, registering about 500 grams on the scale. Like all the other thinkTankPhoto bags I own and use, or have checked out, the quality is superb. There is no skimping on the materials used to build the bag. The details of the materials are noted below in this article, but one thing I always look out for is the zips. I have a tendency to break the metal tabs on zips after continuous use, the TurnStyle uses YKK abrasion resistant zippers with a corded loop and a fat plastic end instead of a standard metal tab. It makes it much easier to grab hold of the slider and far more durable in my opinion. So far we have established that the TurnStyle is well made, but the burning question is how does it go with my gear and what I would use it for? For when I require plenty of space, I rely on my workhorse, which is a TTP Retrospective 20. But for the times I want to travel light, the TurnStyle offers me a great alternative. It allows me to carry my camera body (Canon 5D Mark III) + 50mm f/1.8, a flash and possibly a spare lens; there is plenty of space for that and for my R-Strap to slide in on top. Alternatively, if I am taking my son for a walk, I can have the aforementioned camera body and lens combination, a couple of spare nappies, wipes and nappy bags and still fit his water bottle and some (kiddy) snacks in. Sure I don’t have a change of clothes for an explosion, but then I am close enough to some sort home base to get back and hose him down! The bag is ultra-comfortable to wear as a sling bag. There are no little strips of non-slip materials on the strap but I found that it was not necessary. I love how the kit sits snugly on my back and out of the way, both my arms and hands are totally free to do other things … like pushing a stroller, without having to keep shoving a bag out of the way. Speaking of wearing the TurnStyle though, it is strictly with the strap crossing your chest left to right, does not work so well the other way. And when I need access to the gear, I just have to grab the strap at the bottom and pull the bag around and everything is at my fingertips. Just brilliant. One feature I could not test was the breathable air-mesh back panel. It claims to keep your back cool on a hot day, but since I am still in the depths of winter that was not an issue I had to worry about. You could use the TurnStyle as a beltpack but with a few kilograms of gear in it, it just does not sit quite as comfortably for me. Horses for courses, you may like it! There is a little panel hidden in the area where the rain coat lives that allows you some adjustments with the strap. Note from Peter: I’ve used the TurnStyle 10 this past weekend and found it extremely comfortable and easy to use. The build quality, as stated above, is superb. And for such a small bag it fits a surprising amount of gear inside. On the weekend, I had a gripped 450D, a 10-22mm and an 18-200mm lens in it (my second rig, as my main was doing video), plus a battery charger, plus cards, and I could fit an iPad Mini in the back if I owned one. The build quality and comfort of this bag far exceeds my other camera bag, which is also a sling bag in the form of a Lowepro Slingshot 200AW, which I’ve loathed since I purchased it. This bag is comfortable to wear as a sling for me, which, as a bigger man, is no easy feat. I also found it extremely comfortable to wear around my waist as a belt pack, though it did slip when fully loaded. That said, it is ideal to wear as a belt pack while shooting (i.e. without the weight of the camera in the bag), to have easy and quick access to different lenses/cards. Comfy and practical. The TTP TurnStyle range comes in three sizes – the 5, 10 and 20. Common across all sizes is a front organiser pocket for chargers, memory cards and other small accessories. All sizes also come with a rain cover for days with inclement weathers, or if you just want to cover the openings to your bag. The exterior of the bag itself is treated with a durable water resistant coating, the rain coat is a bonus on top. About the only thing lacking which might be a nice addition is a waterproof pouch/pocket on the bag for a water bottle to make this a truly walk-a-bout friendly bag. Otherwise, this bag offers everything needed for a stroll when you only need a light kit. 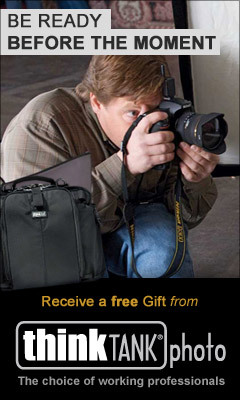 Are you thinking about buying a thinkTankPhoto TurnStyle camera bag? Or any TTP bag? Click here to buy through our affiliate program and you’ll receive bonus goodies on purchases over $50! Exterior: All fabric exterior treated with a durable water resistant coating, plus fabric underside is coated with polyurethane for superior water resistance• YKK® RC Fuse (abrasion resistant) zippers, 420D velocity nylon, 250D shadow rip-stop nylon, 3D air mesh, Y-Buckle, double gate keeper, nylon webbing, 3-ply bonded nylon thread. Interior: Removable high density closed cell foam dividers, 210D silver-toned nylon, polyurethane backed velex liner, 2x polyurethane coated 210T seam-sealed taffeta rain cover, Nylon binding tape, 3-ply bonded nylon thread. USD$74.75, TurnStyle 10 USD$84.75 and TurnStyle 20 USD$99.75, in either Charcoal or Blue Slate. Kevin Cheng is a product of East colliding with West, a juxtaposition of old culture and new. Eternally juggling his roles as husband, father, IT boffin, engineer, chef, photographer, gadget reviewer, writer, whisky connoisseur, wine lover and dreamer. He is generally found in a highly keffinated state and is a workaholic who does not understand the meaning of slowing down. He can be found sporadically on Flickr or say hello on Twitter @aerokev.